Tubular Electrodes are unique concept in hardfacing technology. 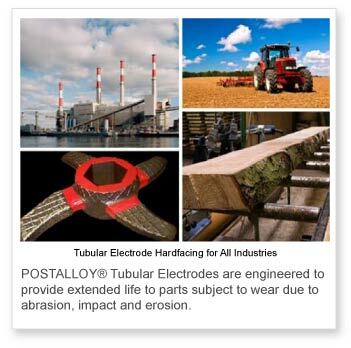 POSTALLOY® Tubular Electrodes are filled with the highest percentage of carbide forming alloys for maximum wear resistance and longest service life of your equipment. In addition to Tubular Electrodes, Postle Industries offers a complete line of Hardfacing Products engineered for maximum service life of your equipment. Description: POSTALLOY® 210HD is formulated with a high percentage of Chromium Carbide producing a tubular hardfacing electrode that is highly resistant to abrasion with mild or moderate impact. Weld deposits are smooth and take on a high polish to resist sliding particle abrasion. It can be apllied to carbon and alloy steels, as well a cast iron. High Compressive Strength - Deposits do not tend to shatter and spall off under conditions of high impact. Ideal for gouging abrasion. Hardness at Elevated Temperatures - The hardness and wear resistance of POSTALLOY 210HD is maintained up to 1000°F(538°C). Welding characteristics are outstanding - POSTALLOY® 210HD can be used on any type of welding machine, either AC or DC, in both flat and vertical positions. Description: POSTALLOY® 216HD (Chapisco), for Roll-Arcing, is primarily engineered for the sugar cane industry and is to be used while the sugar cane roll is rotating. Postalloy® 216HD produces a rough weld deposit that will aid in pulling, tearing and crushing the sugar cane as it feeds through the rolls during processing. Also used for sugar mill rolls hooks (Picote). Description: POSTALLOY® 217HD is modified Chromium Carbide tubular hardfacing electrode, alloyed with Niobium and a small addition of Molybdenum. The microstructure has very fine carbides which give improved wear, errosion and impact resistance over traditional Chromium Carbides. It is designed for applications that require more abrasion resistance than POSTALLOY® 215HD. The Carbide concentration is denser and slightly harder but less brittle than POSTALLOY® 215HD providing a better, more wear-resistant surface. Description: POSTALLOY® 220HD is a proprietary blend of Tungsten Carbide with a small addition of Chromium Carbide. It produces a very smooth weld deposit with improved impact resistance over pure Tungsten Carbide. The unique blend of Tungsten Carbide in a Chromium rich matrix also provides some corrosion protection but primarily helps to provide a high polish in service to reduce the coeffcient of friction. When protection against severe abrasion, with limited impact, is needed, POSTALLOY® 220HD is an ideal choice. Description: POSTALLOY® 221HD is a Tungsten Carbide based product with no Chromium Carbide. It produces a very smooth weld deposit with improved impact resistance over pure Tungsten Carbide. The unique product also provides some corrosion protection but primarily helps to provide a high polish in service to reduce the coefficient of friction. When protection against severe abrasion, with limited impact, is needed, POSTALLOY® 221HD is an ideal choice. Description: POSTALLOY® 225HD is a Chromium Carbide tubular hardfacing electrode, modified with additions of two alloys to improve wear. The micro structure has very fine carbides which give improved wear, erosion and impact resistance over traditional Chromium Carbides . It is designed for applications that require more abrasion resistance than other Chromium Carbides. Description: POSTALLOY® 243HD is modified Chromium Carbide tubular hardfacing electrode, alloyed with Niobium and a small addition of Molybdenum. The micro structure has very fine carbides which give improved wear, erosion and impact resistance over traditional Chromium Carbides. It is designed for applications that require more abrasion resistance than POSTALLOY® 215HD. The Carbide concentration is denser and slightly harder but less brittle than POSTALLOY® 215HD providing a better, more wear-resistant surface. Description: POSTALLOY® 6710HD is modified Complex Niobium Chromium Carbide tubular hardfacing electrode, alloyed with a small addition of Molybdenum. The micro structure has very fine carbides which give improved wear, erosion and impact resistance over traditional Chromium Carbides. It is designed for applications that require more abrasion resistance than POSTALLOY® 215HD. The Carbide concentration is denser and slightly harder but less brittle than POSTALLOY® 215HD providing a better, more wear-resistant surface. • High metal recovery - no slag to chip. POSTALLOY® 6710HD is over 90% efficient.